What type of knife is good for slicing a whole ribeye into individual steak slices? 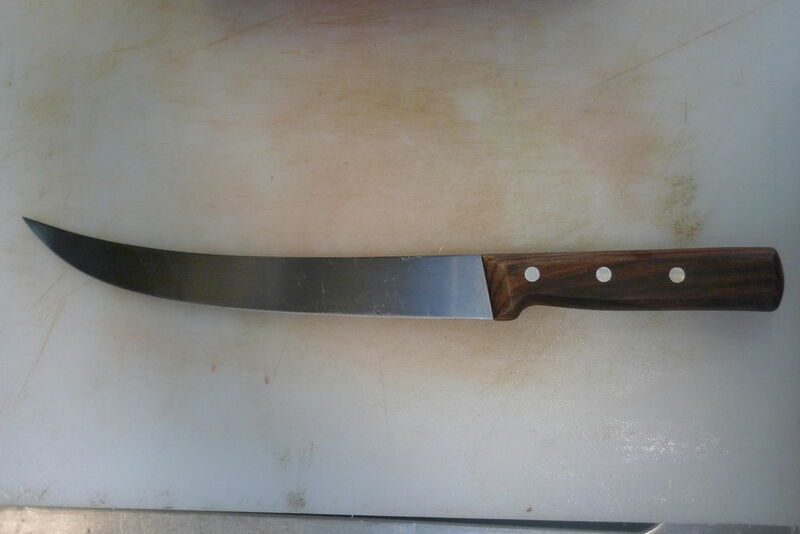 I've looked at some instructional videos on youtube and a butcher used a curved blade, someone else used a long rectangular blade, but I did not know what either of them were called. What type of knife should I use for slicing a whole ribeye? You will need a standard curved 10" butcher knife. You cannot cut a proper steak with a straight-bladed chef's knife, as the blade will not contact the cutting board at the proper angle. The knife needs to be sharp. A sharp knife is less likely to cut you than a dull one because the handler will not have to fight with it. Also, please observe all safety regulations and common sense when using a dangerous instrument like a butcher knife. Long edge - This will minimize the number of cutting strokes needed, resulting in a cleaner cut. Low friction geometry - Raw meat is quite sticky, so a short blade height can help reduce friction from the product as you slice. Other geometry features which can help are surface channels (found in cheese and some japanese santoku knives), and a mid-mounted spine. Very sharp edge - There are many ways to achieve this, but since this knife is used for carving and slicing, it doesn't need great ductility so you can find a knife made with very hard steel (e.g. carbon or high-end stainless) which will hold a sharp edge well. Butcher's knife As @Arrowfar notes above, a 10" (or longer) butcher's knife fits the requirements above, and is popular with butchers who slice raw meat professionally. It allows for quick slicing with moderate precision: a curved blade is harder to slice with precisely than a straight blade. The curve tip provides modest edge contact (but at lower pressure) for cutting skin flaps close to the board. For touch skins you may have to do a final push-style cut to cut through the flap. For cooks trained in japanese-style slicing (make a small cutting incision using a push stroke, and then a swift, long pull with good pressure), the sujihiki cuts meat with incredible precision and cleanliness. Not the answer you're looking for? Browse other questions tagged knives knife-skills cutting or ask your own question.